Do you like listening to stories or making them up? 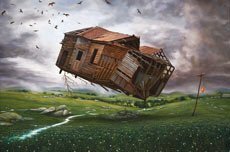 Richard Baxter has painted an imagined event where an old wooden building has been lifted off the ground by strong winds. Birds swirl in the sky and a cat is caught high on the roof, while a rabbit looks up from underneath. The sky is dark and mysterious as we are left wondering what will happen next. Make up your own end to this mysterious story. Draw or paint what you think will happen next in this narrative. What is it about this painting that grabs your attention? Identify the elements in the composition that reference surrealism. Can you spot how many parts of this painting are upside down or sideways? Cameron Hayes has painted a lively scene based on a real tennis match between Martina Navratilova and Chris Evert Lloyd, but has added lots of different activities and scenes around the main game. Our eyes move from one part to the next to see all of the action, the unusual viewpoints and characters that add to the story. We can see crashed cars, castle-like towers, caravans and even the beach. What other unusual things can you spot? How has the artist made reference to tennis? Read the accompanying label text in the prizes database then locate the characters of Navratilova and Evert Lloyd, and identify the symbols Hayes has employed to communicate this narrative. Describe the impact of multiple viewpoints and the use of colour, dramatic lighting and stylisation in this composition. How does the artist draw us into the work using these elements? What does your home look like? The artist, Noel McKenna, has painted a simple view of a living room using thin layers of paint to build up his colours. The room is sparsely furnished and a dog is sitting in front of the fire. Noel likes the idea that how we decorate our homes says a lot about who we are and what we like. What can you tell about the family or person who lives here? List the things you can see in this room. How would you describe the style of this domestic interior? Imagine where the artist is standing in the room. Discuss his approach to creating a composition. Explore how he has used perspective. What creatures can you find in this magnified view of nature? Cameron Potts has enlarged the insects and plants of his vegetable patch so we see them from a very different viewpoint. As a result, he helps us to notice the fine detail of their wings, the shapes of the leaves and the way nature works together in harmony. What can you see in the background? What do you think the artist is suggesting by the title of his work? What is the impact of the micro-perspective? Identify the range of textures you can see. Comment on the forms of the organic matter compared to the manmade structures. What is the significance of the moon in this composition? Do you have a favourite toy? This detailed painting of a garden by Leo Robba shows his children’s favourite toys left in the middle of the path, as if someone has just stopped playing with them. The garden is lush and neat and Leo sees it as a heavenly place, painting it in an almost symmetrical way. Can you spot anything out of place? Describe your impression of this garden. Are any of the plants familiar to you? Find out about the biblical story of the garden of Eden. What might the artist be suggesting with his choice of title? What else in the painting seems to reference this story? How does the inclusion of the children’s toys affect your interpretation? Can you recognise this dinosaur? Andrew Sullivan has painted a large dinosaur head with its mouth propped open so we can see its huge, sharp teeth. Andrew’s detailed painting style and the art materials he’s depicted around the head create the illusion that this scene is real rather than from his imagination. What can you see fluttering between the dinosaur’s jaws? Describe this scene in the artist’s studio. Discuss the significance of the butterfly in the composition. Sullivan commented that this painting is part of a wider body of work which ‘involves research into our consciousness and its relation to evolution’. What do you think he is trying to communicate to the audience? How has he used irony and humour in this painting?